When it comes to organizing things, I operate in two different worlds. If we are talking packing the car for the beach, I go into Tetris mode and start planning five moves ahead for when that zig zaggy shape comes up and completes the perfect row. If we are talking the dishwasher or say… my shop… I just throw stuff wherever it might fit and won’t fall over. If you thought space in my shop was at a premium, you should see my vehicle on an install day. Seats folded down (car seat taken out which is the worst to reinstall), commission build taking up the entire back. Then whatever tools I need to take with me get tossed into a bag or precariously placed so they don’t fall over and scratch up the piece when I inevitably have a clueless West End mommy in her Suburban cut me off on the expressway. All you see is a blur of taillights and a flowery monogram or stick figure family decal go charging by. Husky Tools wants to change this for me though, especially when I take my show (or tools) on the road. 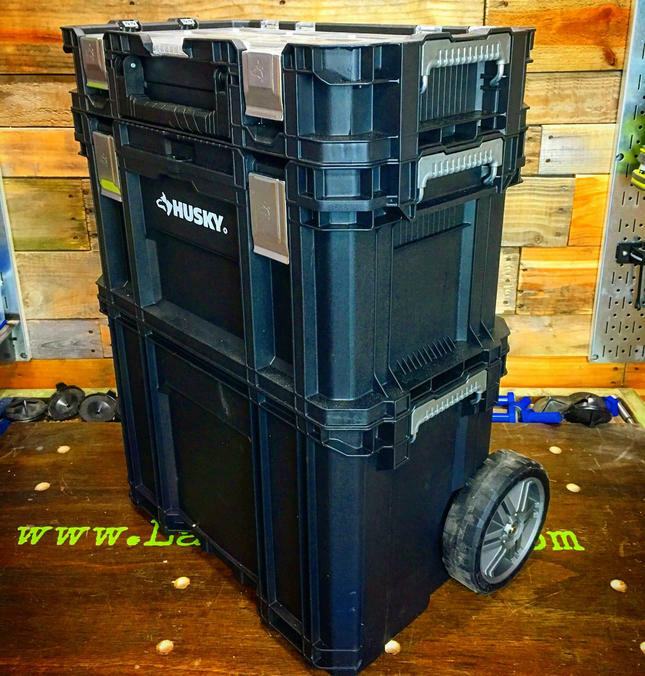 If I had my way and the law (and physics) allowed it, I’d tie one of the Husky 52” Rolling Tool Chests to the back of my vehicle and take that with me on installs. We saw how they test their products in the secret underground Home Depot lab and these Husky products are indestructible. 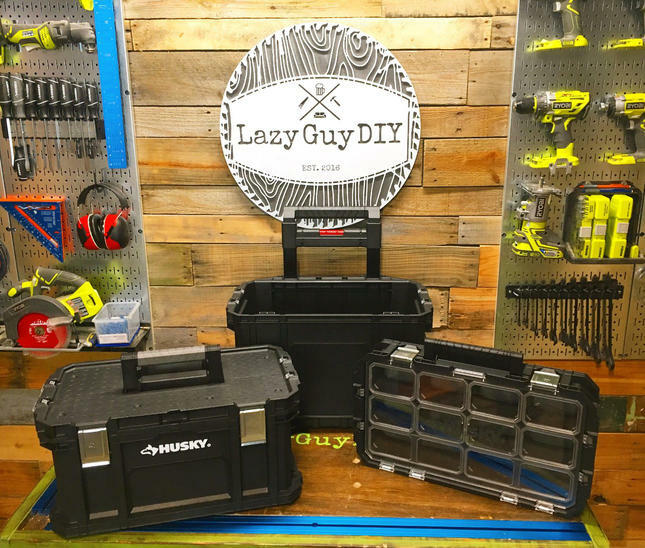 Because the rolling tool chest is probably not road legal, that brings me back down to Earth to the extremely versatile Husky 22” Connect System Rolling Tool Box available for $79.97 at The Home Depot. 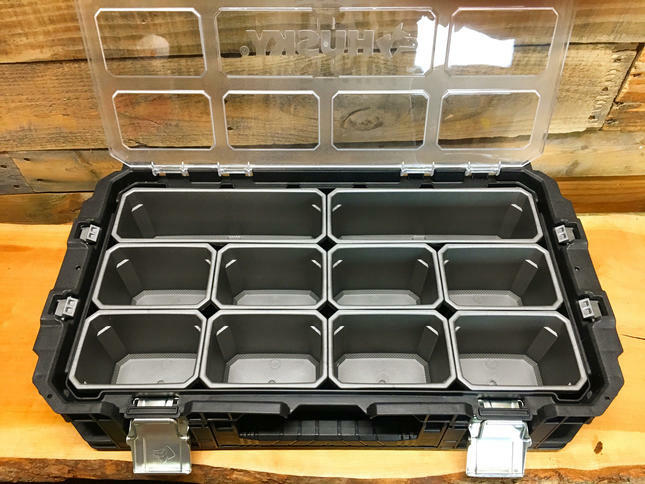 The “bun” tier to this tool box hamburger offers a flat work surface and 12 individual bins to store all of your small goodies. The see-through top latches down securely so you won’t have to worry about all of your screws dumping out if you accidentally drop this ruggedly handsome fella. Even better yet, when you take this top (layer) off and walk around with it, the contents of your bins will be separated like awkward boys and girls at a 1960’s middle school dance (minus that one couple the chaperones are keeping an eye on). 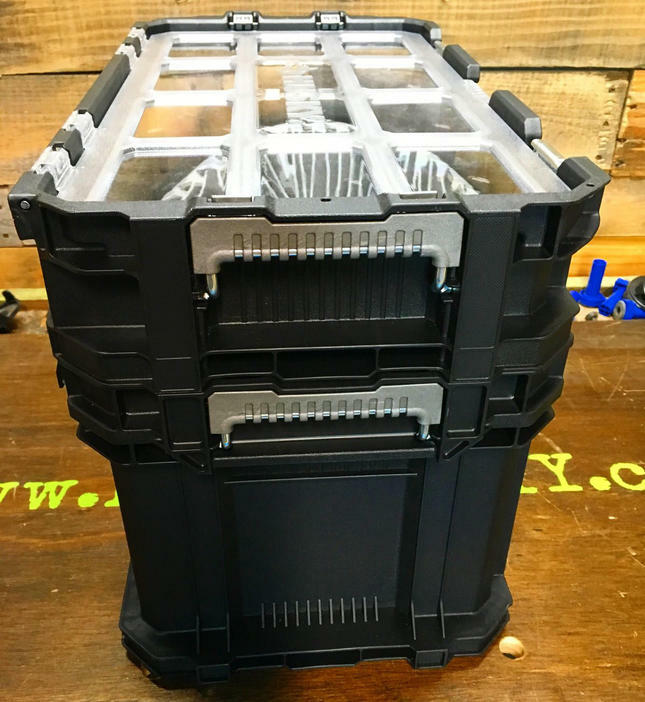 The “burger” tier is a traditional tool box with a removable tray. Once again with secure metal latches, you don’t have to worry about this layer flying open when being transported around (roughly). Socket sets, hammers and my screwdrivers seem to be the best fit along with any other traditional hand tools I want to fit. 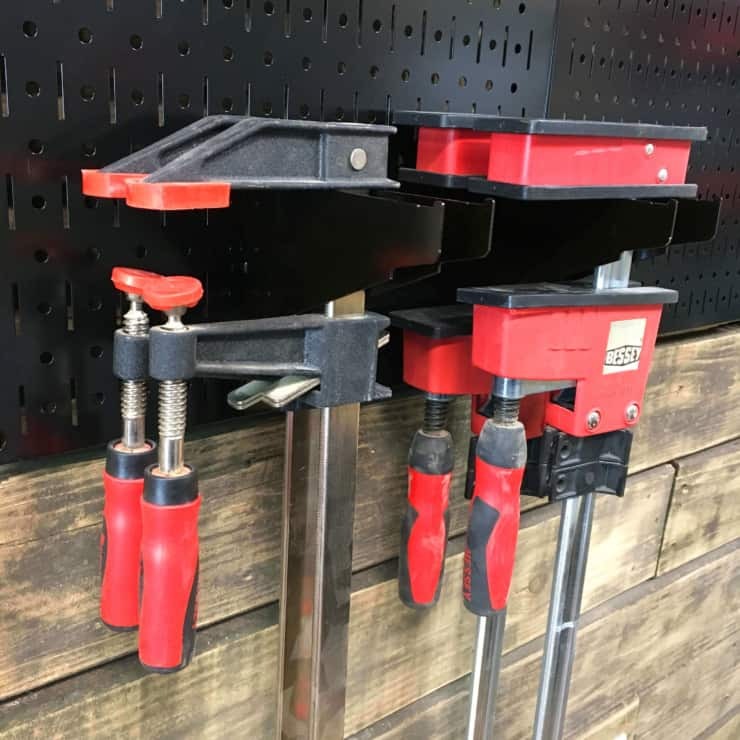 Both layers have handles, so whether I’m toting around the tool box layer by itself or still have the small part organizer attached to the top, I can clip them together and leave the wheels behind. The “bottom bun” tier is the chassis that drives the system. 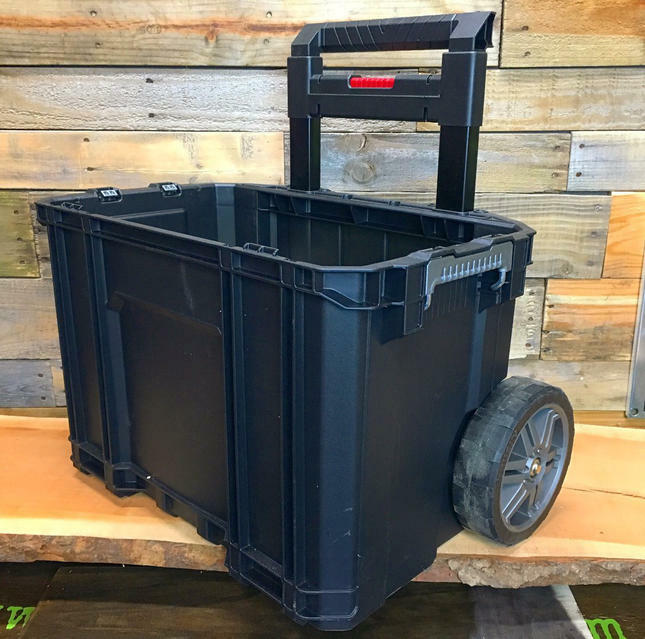 With 7” go anywhere wheels and a telescoping cart handle, you’ve essentially got a the manliest wheeled suitcase around. The bottom bin is plenty deep and is where I store my power tools when I’m on the move. It’s tall enough to hold multiple impact drivers with battery packs attached or in my case; a trim router, a random orbit sander, a sheet sander, extra batteries and a router bit case with room to spare. 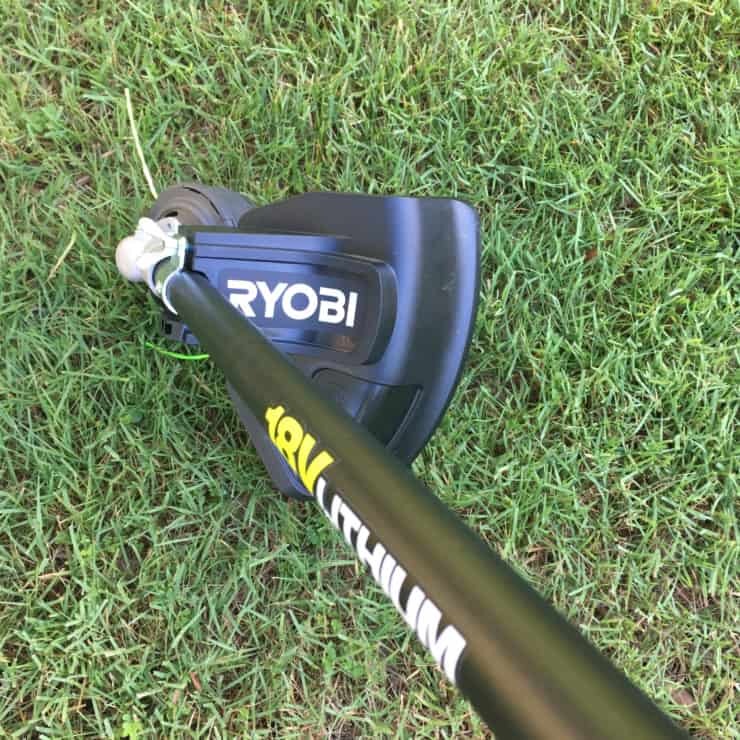 The handle extends to a comfortable height for even a tall guy like me. The whole unit is very sturdy, you can load this thing up and not worry about it flexing and breaking from having too much weight. You will run out of space before you max out its weight load. The same is true for the telescoping handle. I’m sure everyone has tried that one rolling suitcase where you extend the handle and it feels like it’s going to snap in half under the weight of your clothing, shoes and alcohol you’re trying to smuggle back from duty free. Not here. It’s built like a tank. 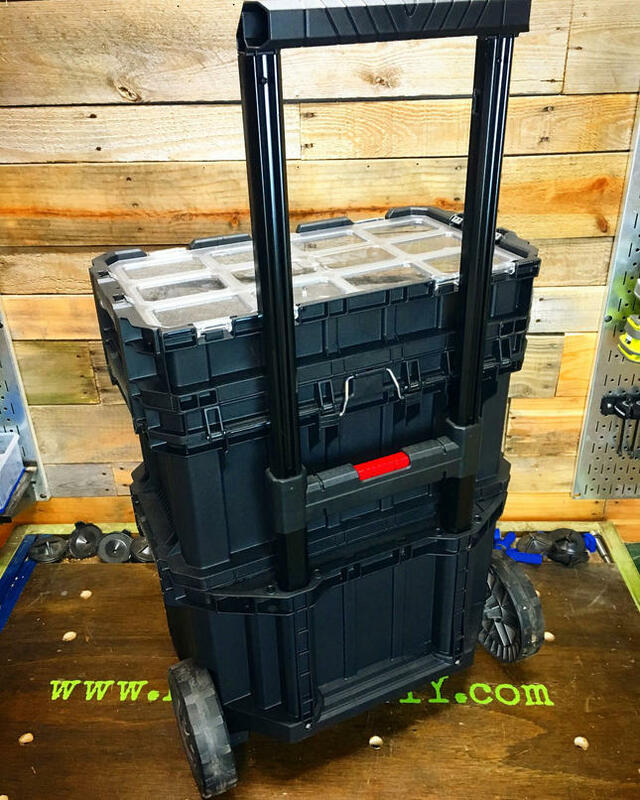 Whether you’re hauling tools to a job site or organizing your craft supplies this is a very durable storage solution that organizes your gear with the efficiency of a Bento Food box. 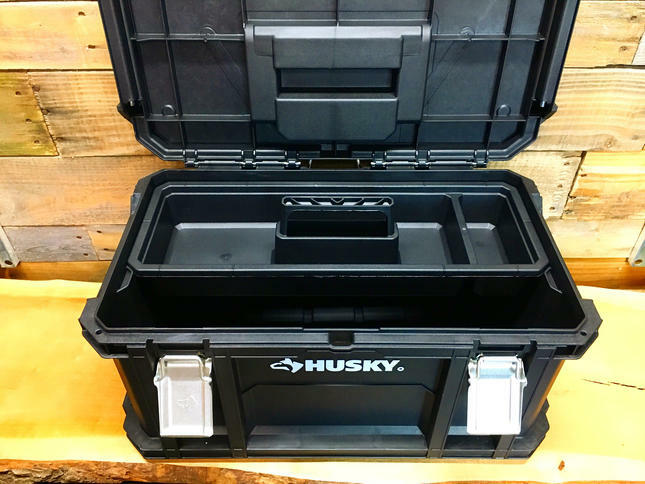 **UPDATE** I’ve been using the Husky Rolling Tool Box for about 8 months now and I’ve absolutely grown to love how much stuff I can jam into it. I’ve taken it to a bunch of installs and clients are amazed when I start un-stacking layer after layer of tools and equipment. If you run installs this is a must have for your business. Can’t get enough Husky Tool Reviews? 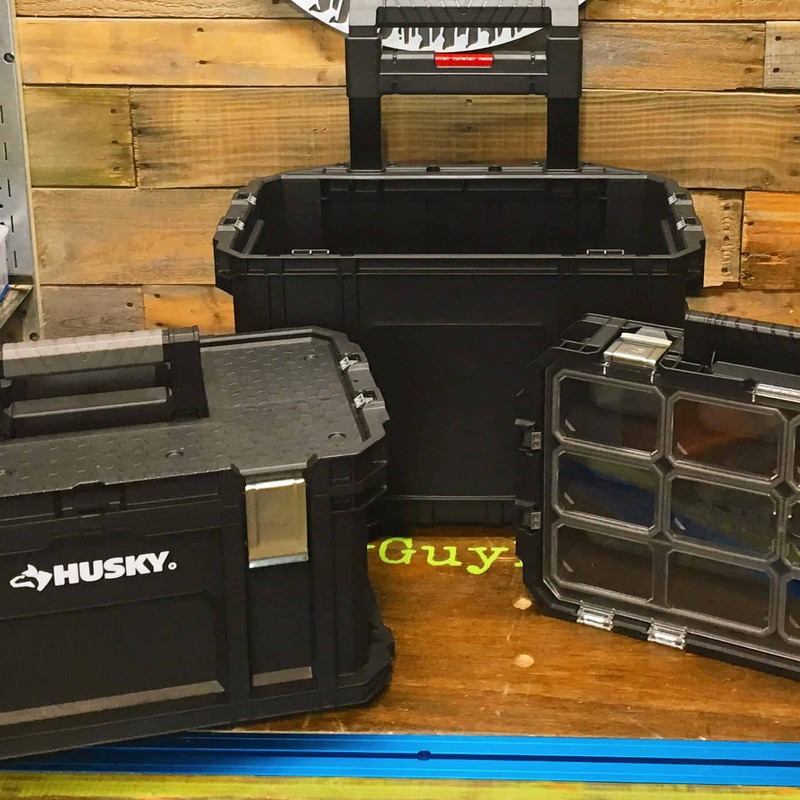 Check out the Husky Tool Review Feed! *This review has been Sponsored by The Home Depot. I have been compensated for my time and provided with products for my review. My opinions are my own… unless you bring Clowns. They scare me. The highlighted links below are affiliate links, which means if you make a purchase from the link a portion of your sale supports this website at no additional cost to you.